Thank you to VTech for providing Cora the Smart Cub for review purposes. All opinions are my own. Interactive learning toys are important for a young child's emotional, cognitive, and social development. Through simple play, children learn about their world. As a parent, I look for toys that are not only educational but fun! 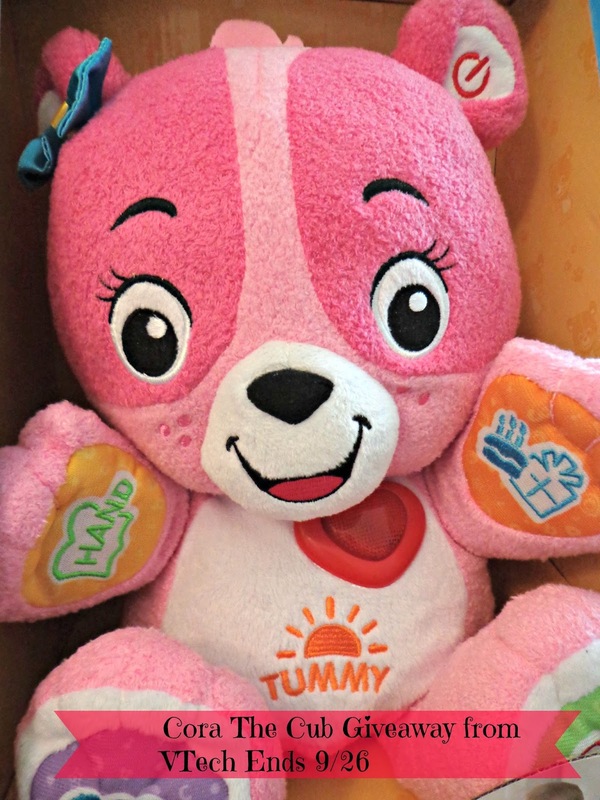 What makes Cora extra special is that she comes with a USB cord that connects to VTech's Learning Lodge where you can download songs, stories, special routines, and you can personalize the bear to say your child's name in greeting. 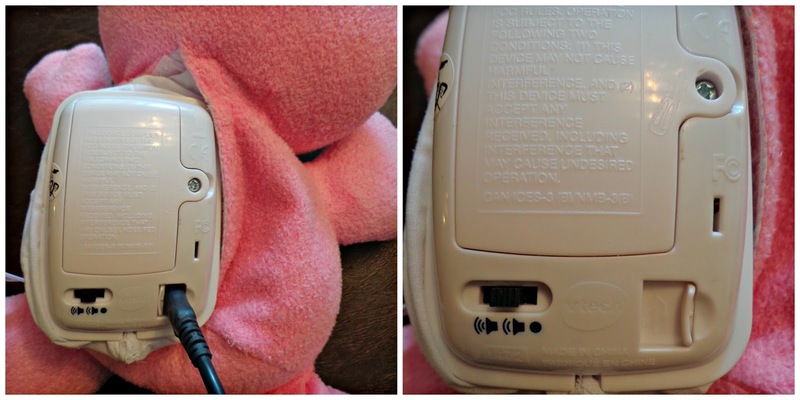 The USB port is located in the battery compartment in the back of the bear which closes with velcro. Mind you, the USB cord is a bit tricky to connect to the bear itself due to the little slider that conceals the USB port. I used a piece of tape to hold the little sliding door open on the first few tries; otherwise it's a bit difficult to keep it open while you're trying to plug in the cord in such a tight little space. Hopefully VTech can think of a way to make that a little easier on mom and dad. Once you get over the tricky connection part, the set up on the VTech site is easy to customize. Simply go through a checklist of selections and download them to Cora. I love how you can change them whenever you want so your child doesn't get bored with the same stories and songs! And one of the great things about her is that she remembers your child's birthday and you can select special people in your child's life to be a part of the stories. The Attic Baby loves Cora's musical aspects and hearing her own name as well as the names of her friends and family members. She talks back to Cora when playing with her. It's a great tool for encouraging language from your little one. 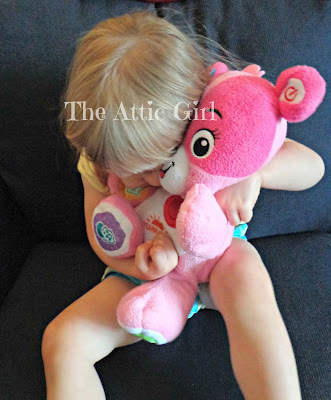 Cora makes a huggable and loveable friend that will grow with your young child from baby to toddler/early-preschooler. 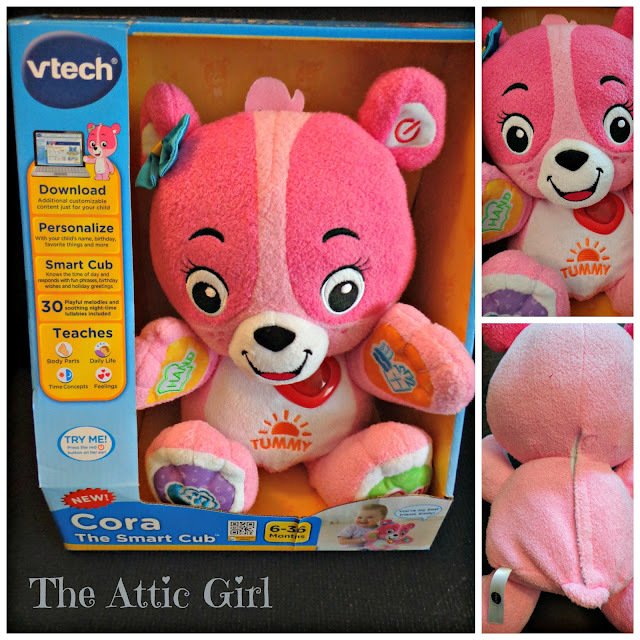 Thanks to VTech, one of my readers will win Cora the Smart Cub! Just use the Rafflecopter form below. You must be a US resident 18 or older to enter. You must complete each task entirely or your entries will not count. This giveaway is not in any way associated with or endorsed by Facebook, Pinterest or Twitter. Giveaway Ends 9/26/13 at 12:01 AM EST. US Residents **18 and older** only may enter. One entry per household and IP address. Winner will be drawn using random.org and will have **48 hrs** to respond to email or another winner will be chosen. Entries are verified. No purchase necessary. Void where prohibited by law. The number of eligible entries received determines the odds of winning. The Attic Girl is not responsible/liable for prize delivery. Disclosure: I received Cora the Cub for review purposes. No other compensation was received and all opinions are my own. 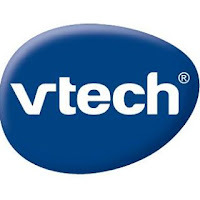 VTech is providing the giveaway prize. For more info. see my Disclosure Policy. 72 comments on "VTech's Cora the Smart Cub #sponsored "
I love the fact you can change up the stories and songs etc. Because children will continue to like this toy even after the "new" wears off. I love the bright pink. My girls would love this. I love the internal clock and the song settings! Birthday and holiday greetings...so cool!! I like that is a cute toy that can still be educational. I could easily seeing it becoming a child's best friend! I like that it is both fun and educational. I can see it easily becoming a child's best friend. I like the 'internal clock' and 'bedtime songs' features the best. Bedtime Songs is my favorite Feature! I love that she plays bedtime songs for varying intervals! I love that you can download your child's name, and favorite songs! I like it because it's soft and cuddly. The music is a plus. If a toy is huggable a child will love it. I like that you can personalize her. My favorite is that you can download content that includes your child's name, their favorite stories, songs and holidays! I love that you can personalize it! my favorite feature of cora the smart cub is the internal clock to remember birthdays! I like that you can switch it up. Love that it is interactive! Love how colorful it is! i love that it teaches and is educational which is a great toy for my lil one whos just starting to learn things this would come in handy! I really love that it teaches feelings! 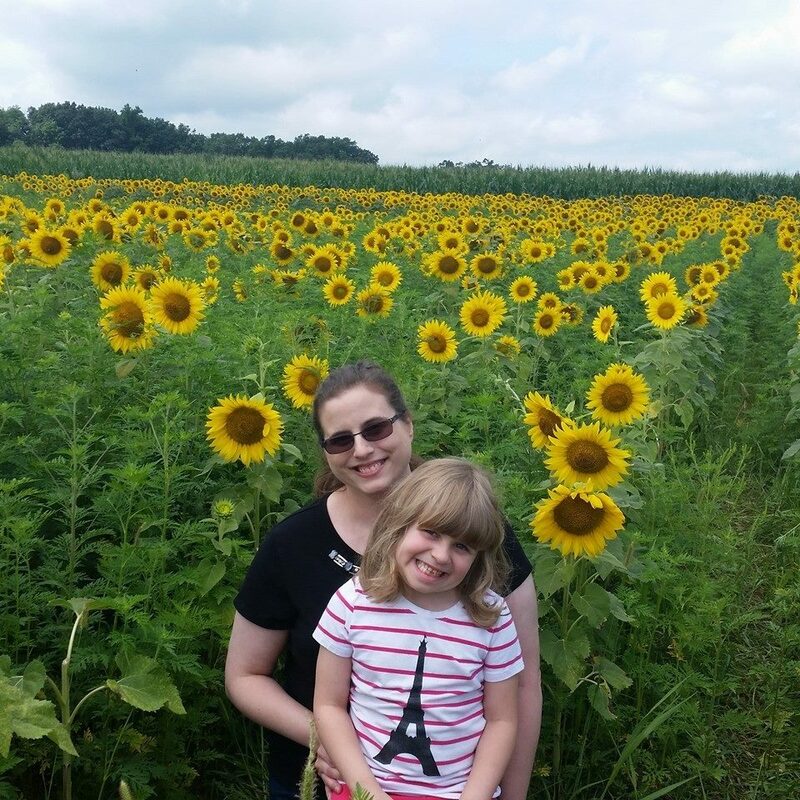 I love that you can customize Cora for your child and upload it with their favorite songs! I like that you can personalize Cora with your child's name, birthday and more. I like that it can be personalized and that you can change the content. the songs are just great! I like that it helps teach daily routine. I love that she plugs in and is programmable. If your child gets bored you can always change stuff around :) Thank you! I like the part that has the content includes your child's name, their favorite stories, songs and holidays! I like that it can be programmed with my child's name and favorite songs. i like the music and how it teaches body parts. I like the nighttime songs! I love all the musical things it can play. I love that you can personalize to your child and the things they love! I really like that it plays the bedtime songs so cute. I love that it can do many different things to teach the little ones and then finish off the night with the bedtime songs!! I love the pink color and that it makes learning fun for the babies. I love the personalized option to say the child's name in the greeting! so fun! I like the different song settings on this great toy. My favorite feature is that the surface is washable. I would love this becuase it teaches her name and birthday!!!! I like that it remembers holidays and birthdays, and sings to baby at night. I love the pink. I like it talks back to Cora when playing with her. The Bedtime Songs are my favorite part! Love the pink color! Goodnight songs are an awesome feature. I like the fact that it can download names, songs, stories and other favorites. That is knows birthdays and holidays. I love the internal clock feature. I like that you can add your childs favorite stories on it. So cute! Doc McStuffins #Docmobile Tour Coming to DC!